The Tri-Roll not only indicates whether a threaded part is within assigned limits, it also shows the exact position of the pitch diameter within a tolerance range. In addition the Tri-Roll will check size and out of roundness of plain cylindrical parts. Fixed mounting of the lower rolls assures a solid support for the work piece. Only the upper roll actuates the indicator, thereby providing repeatable readings. No adjustment required on the lower rolls means that no adjustment is required when changing from one thread size to another. Both the ITC and the Tri-Roll are able to inspect a wide range of parts with a single frame. 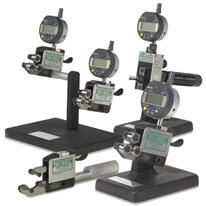 The variable thread system can be used to measure plain diameters and can be used with the "Zero Spindle" gage system. Economical with Long Work Life, the variable thread gage system provides longer life of the tooling and thus reduces cost.